In the midst of unjust and severe sanctions from a number of Arab States led by Saudi Arabia, the small Emirate of Qatar under the wise rule of its Emir Sheikh Tamim bin Hamad al Thani manages to not only successfully overcome all difficulties, but also even achieve new success. Consider the most recent visit of the Qatari Emir to Germany and his successful negotiations with Germany’s top leadership. It is well known that any policy, if successful, is primarily determined by economic factors. The Qatari Emir knows this basic truth well and in the conditions of the current blockade did not come to Germany empty-handed. The Emir’s official working visit was timed to the opening of the Qatar-German Business and Investment Forum held on September 7. The forum was held at a time when Qatari investments in Germany already exceed 25 billion euros in vital sectors such as the automotive industry, information technology, banking services, and a number of other areas. As reported by the newspaper Gulf Times, this important economic and investment event embodies the strength and reliability of Qatari-German relations based on mutual trust and a common vision. The event is also considered to be the cornerstone of Germany’s cooperation with the Arab world. Cooperation between Qatar and Germany includes partnerships in various fields such as science, education, technical training, research, development, new renewable technologies, and others. In recent years, trade relations between Doha and Berlin have expanded significantly. Presently, over 300 German companies operate in the Qatar market. The increase in trade between the two countries has made Germany one of the most important trading partners in the Persian Gulf region. Qatar’s investments into German economy are planned to reach 10 billion euros over a period of 5 years, as stated by the Emir of Qatar, Sheikh Tamim bin Hamad al Thani at the opening of the Qatar-German Investment Forum in Berlin. He recalled that the relations between the two countries began more than 60 years ago and have by now developed into a strategic partnership. “Germany is an important destination for Qatari investments totaling nearly 25 billion Euros,” said the Qatari Emir. “In expression of our confidence in the strength of the German economy, I declare the intention of the State of Qatar to inject investments worth 10 billion euros into the German economy over the next five years.” He specified that Qatar invest in such sectors of the German economy as automobile production, information technology and banks, and noted that despite Saudi sanctions, over 300 German companies currently operate in Qatar. Many of these companies are already involved in projects aimed at developing the infrastructure of the Emirate. For example, Siemens is playing an active role in the expansion of the country’s power transmission network, and Qatar Rail has benefited from the reliable services provided by the German railway operator Deutsche Bahn International. German Chancellor Merkel has every reason to be pleased with the visit of the Qatari Emir. It has just been announced that Qatar Petroleum is negotiating with Uniper and RWE on cooperating on a project for the construction of the 1st liquefied natural gas (LNG) regasification terminal in Germany. It is quite clear that the diversification of energy supplies is very important for a country like Germany which needs a lot of natural gas, including Russian gas from the pipeline as well as gas from other sources. There can be no competition between Qatar and Russia in this regard, which makes sense: it is extremely difficult for LNG to compete with cheap pipeline gas. The likely competition between Qatari gas and LNG from the USA may grow quite harsh. There is another impressive example as well. While Chinese companies stopped buying LNG from the U.S. due to the trade confrontation, the Qatargas state company announced a new contract for the supply of liquefied gas to China. Over the next 22 years, PetroChina International Company Limited, a division of the state company PetroChina, will buy 3.4 million tons (4.7 billion cubic meters) of Qatari gas annually. Qatargas reports that the first cargo will be delivered in September. LNG will be supplied to four terminals in China. The delivery of liquefied gas will be provided by the Qatargas fleet, which consists of 70 gas carriers. 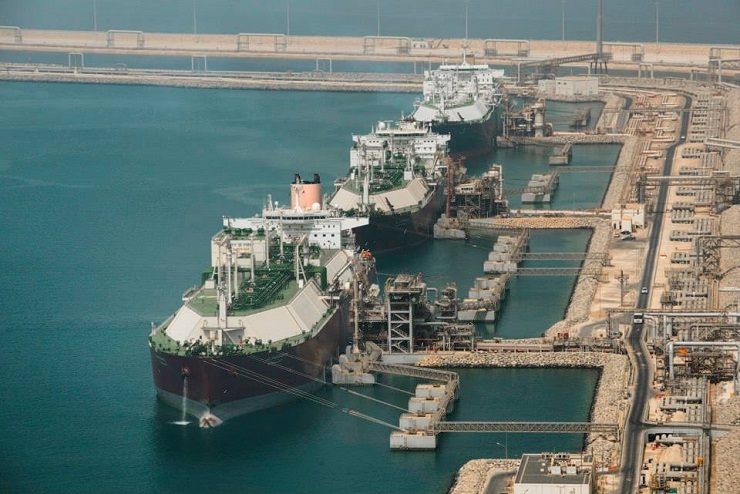 Qatar currently has the largest number of gas carriers and is ready to transport Qatari LNG to any world location. According to Bloomberg news agency, the contract with Qatar may be the first sign of a decrease in American LNG supplies to Asia. Readers may recall that in August, Chinese companies stopped purchasing liquefied gas from the United States against the backdrop of Beijing’s threats to introduce 25 percent tariffs on American LNG. According to experts, additional LNG purchases in Qatar will help China to protect itself from a sharp rise in prices in the spot market. By the way, U.S. companies also have business interest in the import of Qatari gas. PetroChina will receive additional volumes of gas from the Qatargas 2 project, which is a joint venture of the Qatari state company with the American Exxon Mobil and the French Total companies. This way, U.S. and French oil giants will protect the interests of small Qatar. Qatar continues to finance a number of projects in Arab countries. Recently, an agreement was signed on the management of Port Suakin (Sudan) on the Red Sea coast. The Qatari News Agency reports that the Emirate will invest $4 billion in its reconstruction. The signing took place during the visit of the Minister of Transport and Communications of Qatar Jassim bin Saif Al Sulaiti to Khartoum. The project is expected to be completed by 2020, with 51% and 49% shares in its management accorded to the Sudan and Qatar, respectively. “This step would bring back Suakin Port’s historic economic role as a bridge to Africa and a vital economic platform,” said the Minister of Communications of the Sudan. According to the Minister of Transport of Qatar, the Sudan possesses a developed port infrastructure and Suakin Port is of particular strategic importance. It can become an important export destination for the neighboring countries of the Sudan. Following the well-known saying, “don’t put all your eggs into one basket,” Qatari rulers are also establishing friendly relations with Russia through financial investments. The consortium of the Qatar Investment Authority (QIA) and Swiss trader Glencore completed the sale of 14.16% of Rosneft shares to the QIA structure this September. As a result of the transaction, the consortium was disbanded, and now, QIA’s direct share in Rosneft amounts to 18.93%. Meanwhile, Rosneft is one of the main oil giants in Russia, and last year it ranked third among Russian companies in terms of revenue. Who would now doubt Qatar’s influence over the oil industry, and in a way, even over Russian markets, which greatly depend on oil as one of its main currencies. Is not this policy, which allows small Qatar to attract friends by investing its available funds in them, very reasonable? A notable outcome of Qatari policy is the fact that the UN World Tourism Organization (UNWTO) called Qatar the most open country in the Near East and the 8th most open in the world in terms of visa facilitation. In August 2017, Qatar simplified visa requirements for the citizens of 80 countries, including Russia. The visa is now issued free of charge at the airport upon entry into the country. Analyzing the current situation in Qatar and the successful measures taken by the Emir, we can say that the Emirate has successfully emerged from the sanctions crisis and continues to strengthen its global position.